Got my Make It Mine purse updated. Figured it was time to take off the pics from LAST summer... 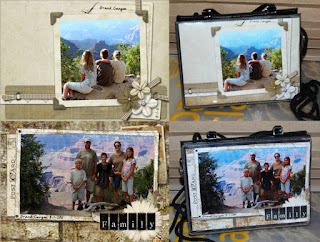 I used our Grand Canyon pics and to make it easy, I used ploppers from Digital Scrapbook Place (of course). Maisee's Family (bottom pic) and Relax & Enjoy (top pic). Plopped in my photos, text box for the date, finished! Well, hit print, then finished.